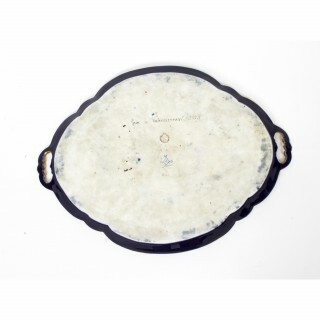 This is an absolutely fabulous antique Sevres porcelain oval two-handled tray, dating from the mid 19th Century. 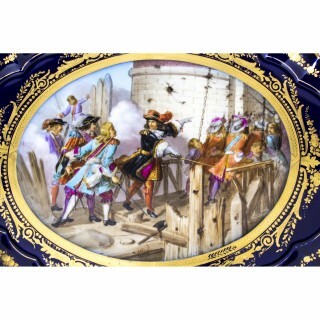 Beautifully hand painted and commemorating a 1677 battle scene, the “Prise de Valenciennes” (Siege of Valenciennes), highlighted in gold on a Royal Blue ground and signed lower right, Moreau, the underside with the interlaced “L”s Sevres mark, a painted “Prise de Valenciennes” mark as well as a red printed Chateau mark. 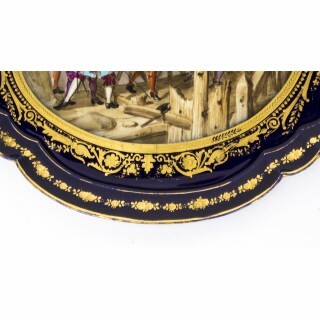 Sevres Porcelain traces its roots in France to early craftsmen who had small manufacturing operations in such places as Lille, Rouen. St. Cloud, and most notably Chantilly. It is from Chantilly that a cadre of workers migrated to the Chateau de Vincennes near Paris to form a larger porcelain manufactory in 1738. French King Louis XV, perhaps inspired by his rumoured relationship with mistress Madame de Pompadour, took an intense interest in porcelain and moved the operation in 1756 to even larger quarters in the Paris suburb of Sevres. Sevres was also conveniently near the home of Madame de Pompadour and the King’s own Palace at Versailles. From the outset the king’s clear aim was to produce Sevres Porcelain that surpassed the established Saxony works of Meissen and Dresden. Though the French lacked an ample supply of kaolin, a required ingredient for hard-paste porcelain (pate dure), their soft-paste porcelain (pate tendre) was fired at a lower temperature and was thus compatible with a wider variety of colours and glazes that in many cases were also richer and more vivid. 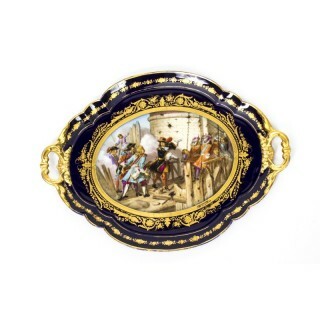 Unglazed white Sevres Porcelain “biscuit” figurines were also a great success. 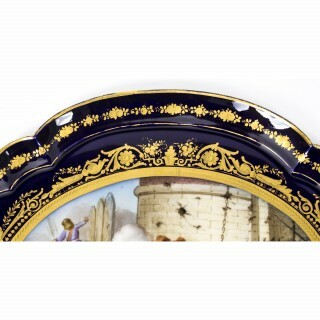 However, soft-paste Sevres Porcelain was more easily broken. 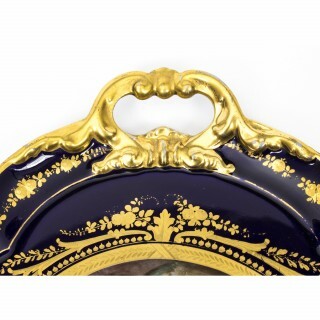 Therefore, early pieces of Sevres Porcelain that remain intact have become rare indeed. The Sevres Porcelain manufactory always seemed to be in dire financial straits despite the incredibly fine works it produced. In fact, the king’s insistence that only the finest items be created may have contributed to the difficulties. Only a limited number of European nobility could afford the extravagant prices demanded for such works. King Louis XV and eventually his heir, the ill-fated Louis XVI, were obliged to invest heavily in the enterprise. 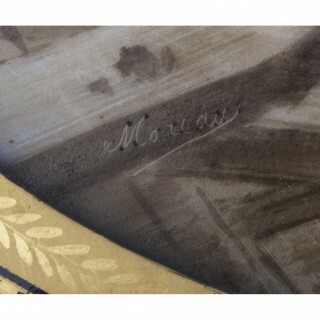 Ultimately, the Sevres Porcelain Factory produced items under the name of “Royal” and thus the well-known Sevres mark was born. King Louis XV even mandated laws that severely restricted other porcelain production in France so as to retain a near monopoly for his Sevres Porcelain. 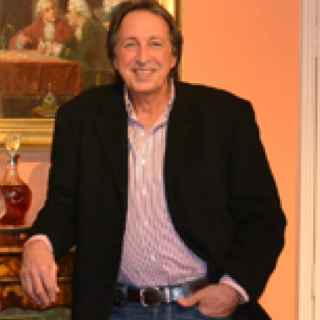 The king even willingly became chief salesman for the finest of his products, hosting an annual New Year’s Day showing for French nobility in his private quarters at Versailles. He eagerly circulated among potential buyers, pitching the merits of ownership and policing the occasional light-fingered guest.